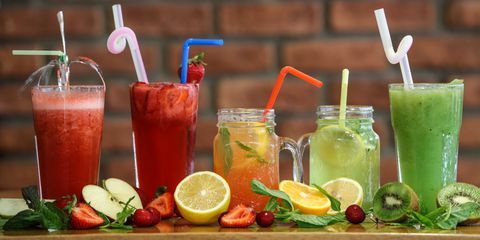 Cocktails with fruit are very interesting mixes, in addition to the healthy contributions of fruits, also provide different flavor and textures. These delicious combinations are very easy to prepare and will bring a lot of different nuances. No matter what season of the year we are in, cocktails with fruit are always suitable for any party. They can be prepared with or without alcohol. Next, we present some cocktails with fruits that you can prepare quickly and easily. 2 teaspoons of sugar (10 g). ¼ cup of raspberries (37 g). 3 tablespoons of gin (45 ml). 1 tablespoon of vermouth (15 ml). 2 tablespoons of lemon juice (30 ml). 2 thin slices of cucumber. First, put a martini glass to cool. Next, peel the cucumber and cut the slices. You also need to gently wash and drain the raspberries. Squeeze the lemon juice and strain it. Next, put the sugar with the cucumber and the raspberries in a shaker and press until the fruit is crushed. Then add the gin, vermouth, lemon and egg white. Next, shake the shaker very well. Stop and add a handful of crushed ice and stir again with energy. Finally, strain on the cold glass and serve. 1 cup of sugar (200 g). One medium watermelon (3 kg). 1 cup of water (250 ml). 1 cup of lime juice (250 ml). ½ cup of triple dry (125 ml). Mint and mint leaves (to taste). 1 ½ tequila glasses (300 ml). First prepare a simple syrup, for this, heat the water with the sugar until it dissolves. Peel the watermelon and extract the pulp, discarding the seeds. Mash and separate about 3 and a half glasses of watermelon puree (700 ml). Grind the watermelon in the glass of a large blender together with the syrup, the lime juice, the tequila, the triple dry and the crushed ice. Serve in glasses or glasses with ice and decorate with mint leaves and triangles of fresh watermelon. 3 tablespoons of whiskey (45 ml). 1 tablespoon of coconut liquor (15 ml). 2 teaspoons of pisco (10 ml). 1 spoonful of mango juice (15 ml). Chopped ice to fill the glass. 1 tablespoon of lime juice (15 ml). Cools a tall glass with a slightly wide mouth while stirring some ice cubes inside. Add all the ingredients, except the crushed ice, and mix lightly. Add the ice and stir well with a special cocktail spoon. The mojito is a type of cocktail very widespread and that pleases almost everyone. On this occasion, we prepare a variant of this delicious drink. 1 teaspoon of dried hibiscus flowers (5 g). 3 tablespoons of brown sugar (45 g). 1 teaspoon of sugar (5 g). 3 tablespoons of white rum (45 ml). 1 cup of blueberries (150 g). Mint or mint leaves (to taste). 1 cup of pomegranate seeds (125 g). ½ cup of soda (125 ml). Heat the water with brown sugar and dried hibiscus flowers. Remove from heat and let cool. Strain the mixture to remove the flowers. Crush the blueberries together with the seeds of the pomegranate. Strain to extract the juice. Place mint or peppermint leaves, lime juice and sugar in a shaker. Crush well and add the cranberry juice with a ¼ cup of the prepared hibiscus syrup (50 ml). Place ice in a large glass, fill three quarters with the cocktail preparation and complete with soda. Decorate with mint leaves and whole blueberries. The last of this list of cocktails with fruits is based on a mixture of cava and fruits. This combination will be perfect to end any celebration. 3 ½ glasses of dry cava (700 ml). 1 cup of fresh blackberries (150 grams). Cut a strip of lemon skin, without reaching the white part, and heat with sugar, water and thyme, reserving a few sprigs to decorate. Heat about 20 minute s over low heat until the sugar dissolves. Strain and let cool. Divide the liquid in 6 glasses, divide the berries and stir with energy to break the fruit and mix with the syrup. Fill with the cold cava and decorate with a little thyme.